I had a thrilling time at the Royal Albert Hall this week, playing Juliet in English Pocket Opera Company’s idiosyncratic production of Romeo and Juliet. Featuring an orchestra of 600 and a choir of 900, the performance was broadcast live on the internet, and can be viewed for the next month. 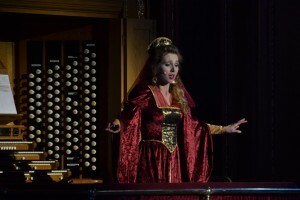 This lovely photograph was taken by Joshua Hayes, www.joshphotographer.com: I’m singing Gounod’s “Je veux vivre” from the Albert Hall’s organ loft representing Juliet’s balcony.